Another recipe from FamilyFun.com. If you can't find Israeli couscous, try using orzo pasta. Bring a large pot of lightly salted water to a boil. Add the zucchini and yellow squash and cook just until tender but still crisp, about 2 minutes. Scoop the vegetables out of the water with a sieve, reserving the boiling water. Rinse them under cold water and set them aside. Add the couscous to the boiling water and cook it until tender (10 minutes or more). Drain the couscous. Rinse it well with cold running water, then drain it well again. In a large bowl, whisk the lime juice, curry powder, cumin, turmeric, and chili pepper powder. Gradually whisk in the oil. 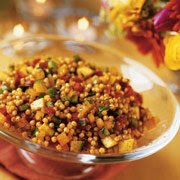 Mix in the couscous, reserved vegetables, cilantro, and parsley. Season the mixture with salt and pepper. Cover and refrigerate for at least 1 hour, until chilled. This salad can be prepared a day ahead; just reseason with lime juice, salt, and pepper before serving. Any way you could post this recipe directly? I'm having a hard time finding it on the linked site. Thanks for your help, your quick start recipes are truly a lifesaver!! !